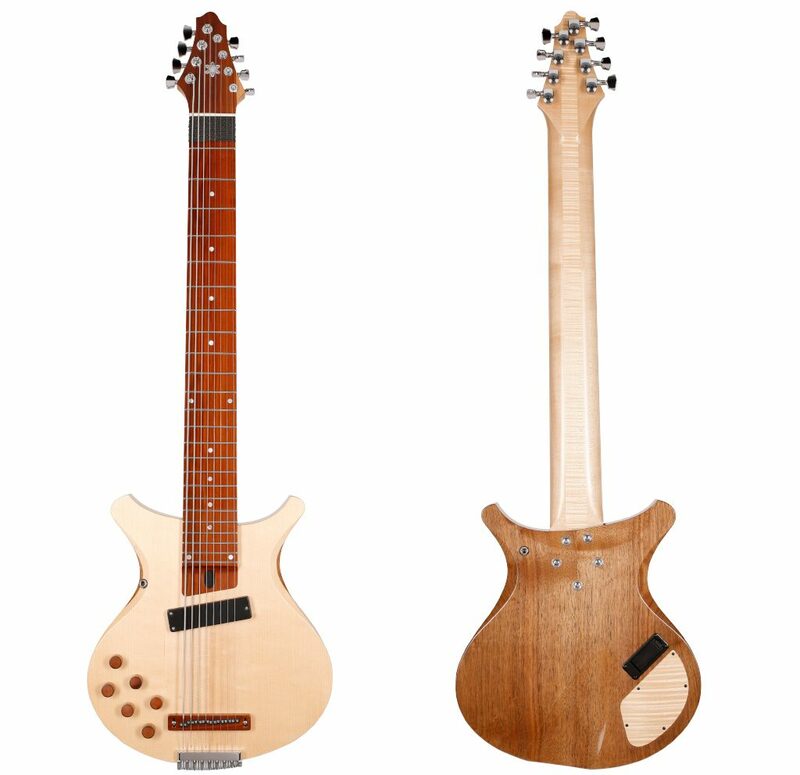 The AU8 (introduced in 2015) is the first semi-acoustic 8-string Touch Guitar model. Built to similar dimensions to those of the U8 Deluxe, it’s a completely handmade hollow-body guitar with one magnetic pickup, supplemented by eight piezo pickups. An active electronics setup allows for the volume of each individual string to be adjusted; and there are two onboard 2-band EQ controls (one for the piezo pickup system and one for the magnetic). This arrangement gives the AU8 the most dynamic sound potential of all the Touch Guitars®, centred around a very full acoustic sound which is unique in the touch-style instrument world (and allowing extensive tonal and sonic adjustment prior to amplifier/pedalboard processing). As with all Touch Guitars®, construction and finishing options (from the different wood types used through to custom paint and varnish) are discussed with and chosen by the customer, as part of the custom-creation process. An additional option available on the AU8 is the choice of a distinct wood for the instrument’s top. All woods are specifically sourced from local central European woodlands. In this short series of videos Stefan Huth explains the basic features of our AU8.